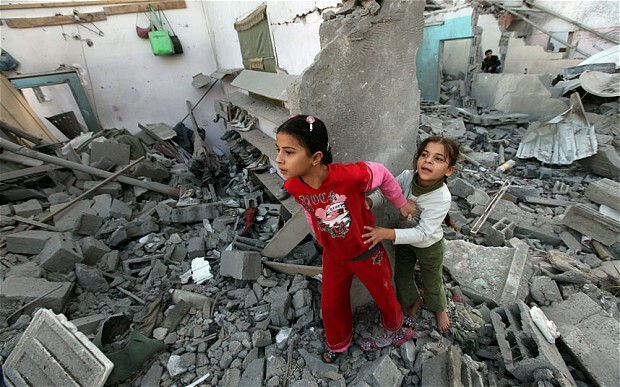 Children in Gaza walk in the rubble. Rocket blasts deafen the screams of children as they flee from the beaches. Playing is not allowed. Innocence is quickly deleted. Decrepit wagons filled with precious cargo cross craters. Plenty of fear fills their every step. They not know where to go. How? If shelters become targets. Religions become crimes. A nationality becomes a reason for hate. The heavens become hell. Even from space, the exits are unclear. They are told to leave. But no one opens a door. So when does history stop mattering? When does it become about the present? I wonder. I wonder if half of Gaza understands its past, how can they? They are so young! They have not lived it! Children who will become tomorrow’s history so that we question ourselves yet again. Because I do not have one god. Because there should be no concrete borders and barb-wired maps. Because rockets are meant to makes us dream of space. Because being wrong, perhaps is being right. Because killing yourself won’t stop the killing. Because in this world there are Sunni, Shiite, Christians, Buddhists, Taoists, Hindi and Atheists.